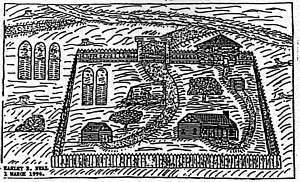 "The present territory of Franklin County, Illinois was settled first in 1804, near Liberty Church, about two and a half miles southeast of Thompsonville, by seven Jordan brothers, two Browning brothers, William Barbrey and a family by the name of Estes. 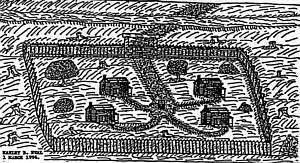 These families remained together for protection against the Indians and to help erect the houses..." (Aiken). The seven Jordan brothers mentioned by Aiken are Francis, Thomas, James, Elias, Reuben, William and Joseph. The two Browning brothers are John and William. William married Matilda "Mollie" Jordan. The others mentioned are Joseph E. Estes and William Barbrey, both brothers-in-law to the Jordans. All of these first settlers were related to the Jordans. "Here, along Prairie Creek, they constructed a pole shed (3-sided log cabin) covered with brush, thatched with grass and chinked with mud. The south side of the shed was open, and a huge fire kept burning in front of the opening for warmth" (Neal). "Governor Ninian Edwards sent out word to every settlement to build block houses or forts as a means of protection against the Indians. So the Jordan settlement built a strong fort on what is now the farm of Capt. John Ing, and another on the edge of Williamson County" (Aiken). 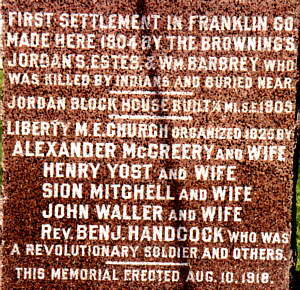 "Francis Jordan apparently was the leader of the group of brothers, relatives, neighbors, and militia from Equality who built the fort that was to be called Francis Jordan's Fort, Frank Jordan's Fort, Frank's Fort and lastly Frankfort to distinguish it from another and apparently older place called Jordan Brothers' Fort or Tom Jordan's Fort. ..The Jordans evidently were fort builders" (Allen). The first fort, commonly referred to as Old Jordan Fort, Tom Jordan's Fort or Jordan Brothers' Fort, has a rich history. It was the first of several forts built by the Jordans. The Jordans constructed forts at Equality, Eldorado, Raleigh, Galatia, Thompsonville and West Frankfort. "In the year 1812, James Jordan and Mr. Barbrey, while out of the fort gathering wood, were fired upon by the Indians. Barbrey was killed and scalped. James Jordan was wounded in the leg. After obtaining re-enforcements from Frank Jordan's Fort, which was then located in what is now known as Williamson County, about three miles south of the first named fort, the whites started in pursuit of the Indians,...but did not succeed in overtaking them. 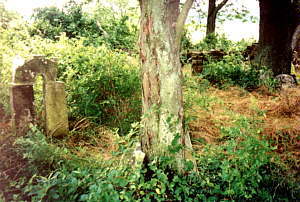 Barbrey was buried at the fort and his grave still remains near the residence of Judge William Elstun. This was the starting of the first graveyard in Franklin County" (Frankfort Area Historical Society). "In 1812, Andrew Moore and his 10 year old son, who lived fifteen miles on the Goshen Road and southeast of Mt. Vernon, Illinois, went one day on horseback to the Thomas Jordan Fort and Settlement to mill their grain. They expected to return the same evening or the next day. But when they did not return, Mrs. Peggy (Bales) Moore took her children to meet her husband. Mrs. Moore finally reached the mill; and, they learned from Thomas Jordan that Andrew Moore and his son got their grinding and had started home. While encamped near the crossing of the old Massac Road over the middle fork of the Big Muddy, they were attacked and killed. A search party from the Thomas Jordan Settlement was engaged for several days to no avail. Some years afterward, a hunting party found a human skull stuck on a tree limb within a mile south of the Andrew Moore residence. It was theorized that the Indians killed Andrew Moore and carried his son into captivity along with the horses and meal" (Perrin). 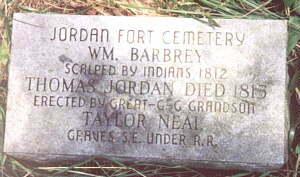 "Jordan's Fort remained an important post during the War of 1812. Some killings by Indians in the vicinity of these forts are cited as reasons for the declaration of War with Great Britain" (Allen). 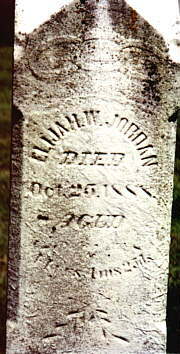 In 1815, Thomas Jordan, Sr., father of the seven Jordan brothers, died and was buried in the Old Jordan Fort Cemetery. In the 1930's, the Illinois Central Railroad laid their tracks right through the Old Jordan Fort Cemetery. As a result, the William Barbrey, Thomas Jordan, Sr. graves, along with others, are under the Illinois Central Railroad fill. As a result, few of the original grave markers remain. It is estimated that about 60 graves made up the cemetery. During the building of the railroad, Barbrey's marker was moved to the west. A small fence encloses what remains of the Old Jordan Fort Cemetery. 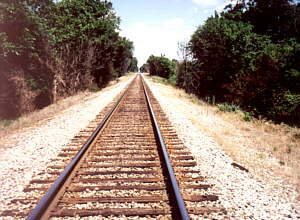 Tracks of the Illinois Central Railroad. The fort on the edge of Williamson County was called Francis Jordan's Fort. "Later when the town of Frankfort was started they gave it the name of Francis Jordan's Fort. The name Jordan was omitted, calling the place Francis' Fort, or Frank's Fort and still later Frankfort" (Aiken). "In 1810, the Francis Jordan Fort acted as a Way-Station and a Safe-Refuge for the settlers from the Indians. The Francis Jordan Fort was located on an Old Buffalo Path (Jordan Trail) in 1810 and near the Shawneetown-Kaskaskia Trail. The Jordan Trail was the first local road in the county. It ran from Big Muddy River near Blairsville, Illinois across Schoharrie and Herris's Prairie in Williamson County, Illinois across the Golconda-Kaskaskia Road to Shake Rag (Jeffersonville) to Frank Jordan's Fort to near Galatia, Illinois on the Shawneetown-St. Louis Trail" (Neal). Nancy Jordan, daughter of Thomas Jordan, Sr., was born about 1767 on Jordan's Creek, Granville County, North Carolina. 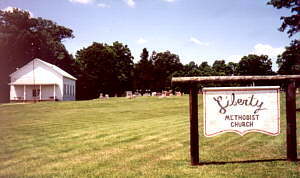 She married Aaron Neal around 1782 in Warren County, NC. They had ten children. Aaron Neal died January 28, 1818. Nancy Jordan Neal died in 1835 and is buried in the nearby McFall Cemetery. No grave marker could be found at or near the McFall Cemetery for Nancy. The McFall Cemetery is not maintained. "The historical importance of old Frankfort is the fact that this scenic hill was chosen in 1821, by the appointed commissioners as the first county seat of the newly organized Franklin County. Being the first town in the county and the first permanent county seat, Frankfort rapidly developed into the leading trading center until 1841, after which all Franklin County proceedings were held in Benton, the new county seat" (Frankfort Area Historical Society). October 26, 1888 - A tragedy occurred at Thomponville at the Boarding House of John MORRIS Wednesday night. Warren JORDAN, post master at Fitt's Mill, and John WILLIAMS of Frankfort were both killed. They and others had been drinking and playing cards when a quarrel arose over 23 cents. WILLIAMS drew a knife and cut JORDAN on his face and arms. JORDAN then drew a pistol and shot WILLIAMS twice. JORDAN then turned and left, going about 100 yards when Charlie WILLIAMS, a brother to John, came up behind him and hit JORDAN in the back of the head with a hatchet, cutting out his brains. JORDAN died about 3 hours later. Charlie WILLIAMS is now in jail. All of the parties are from excellent families and of the first settlers of the county. JORDAN has an excellent family and was himself a noble man of splendid impulses and a generous disposition, though a few times in his life a little wild. WILLIAMS was said to be of a generous nature but addicted to drinking.